Tanna is one of the most fertile islands in Vanuatu and produces kava, coffee, coconut, copra and other fruits and vegetables. Tanna is fascinating with the local culture largely unaffected by the western way of life. Port Resolution was named after Captain Cook’s HMS Resolution, the first European ship to visit the island in 1774. 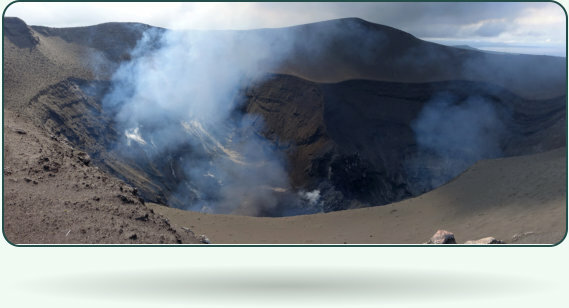 Cook was attracted by the glowing light of Mount Yasur. We were driven in pickup trucks along mud tracks to the nearby Mount Yasur, an active volcano that has been erupting nearly continuously for 800 years and is rated as one of the most active volcanoes in the world today. We climbed up to the volcano rim to watch a spectacular display of erupting lava. Over the centuries , ash rain from Mount Yasur has built up huge black sand dunes, creating a stark moonscape.